The Senior Data Journalist will take a lead with the editorial element of our multi-disciplinary Digital Content team, working collaboratively with business areas to create high quality editorial materials in text, data and visual interactive. Working with designers, web developers and statisticians, to produce compelling stories which connect data with a variety of audiences. Degree in journalism or a related subject OR relevant publishing qualification AND/OR equivalent practical experience in data-driven journalism. Practical experience of working in digital publishing, writing content for multiple channels, to challenging deadlines. Can you guess what organization is hiring this Senior Data Journalist? No, it’s not a media organization. This job opening was run last year by the Office for National Statistics. And what’s more: if you’re quick, you can still apply to work as a data journalist under this senior data journalist. The ONS, one of the leading national offices for statistics worldwide, clearly has ambitions in the field of data journalism. Visual.ONS is a website exploring new approaches to making ONS statistics accessible and relevant to a wide public audience. The site will be a home to a variety of different content, including infographics, interactive visualisations and short analysis, exploring data from a range of ONS outputs. And what about Let’s get married. OK - when?, a longform multimedia piece, including video, historical photos and static and animated charts. A production many newsrooms would be very proud of. So what’s wrong with government institutions doing data journalism and producing editorial content? In the end, they are the ones that put all the effort in collecting the data. And they are the ones that know the data best. Great that they now offer their data and their insights in more beautiful formats, that are accessible to lay people. Right? Well, in times of decreasing budgets, critics say that statistical offices should stick to their core tasks of gathering, checking and publishing raw data. Inevitably, resources that are spent on data journalism and multimedia productions are resources not spent on statistical work. This discussion is also going on the Netherlands, where the Centraal Bureau voor de Statistiek is presenting itself more and more as a news organization, reacting to breaking news and playing a bigger role in the public debate. It now has a newsroom of 25 editors. At the same time, the collection of new data on 30 statistical time series was discontinued. The CBS newsroom, called 'the most beautiful place I worked in in 30 years of media' by editor in chief Mike Ackermans. Read Ook onze statistiek wordt nu bepaald door de waan van de dag (Dutch), if you would like to read more about the CBS case. When statistical offices do data journalism, they produce editorial content. This means that stories have a focus and things are left out. In data terms, this means the published data is aggregated, filtered or translated into graphics. As long as the full, raw, unaggregated dataset is published alongside the data story, this doesn’t really pose a problem. But when offices cultivate an attitude of ‘the story is published, the public is informed, no need anymore to publish the raw data’, then this does pose a problem. Because then offices will make the editorial choices of what is important in the data and anyone else with an interest in the data is cut off from the raw data. 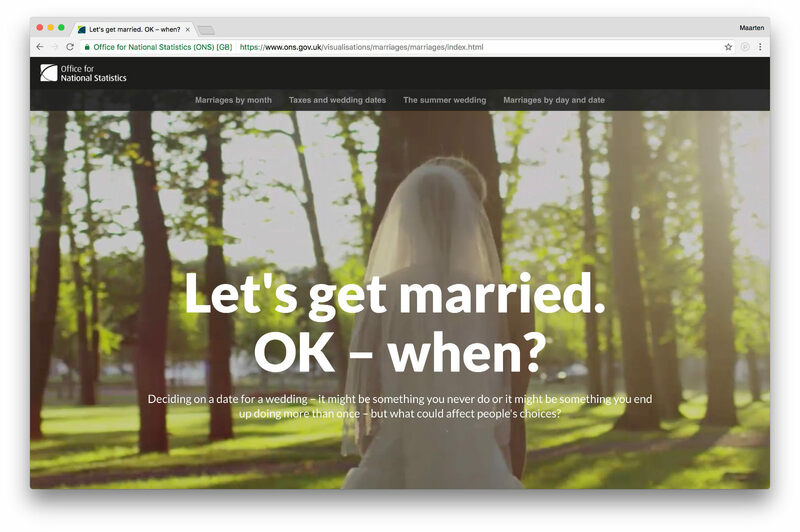 If you think this is an hypothetical scenario, do read Civil partnerships: the ONS and the data journalist by online journalism lecturer Andy Dickinson. He describes the case of an ONS dataset on civil partnerships that in September last year wasn’t published fully any more. Instead, the ONS made an analysis and only published a summary. Less democratic leaders not seldom are in conflict with their statistical offices: the latter will sometimes show how bad the shape of the country is, while the former wants to demonstrate how well he or she is leading the country. As an example: read INDEC, the lying machine, on the war between the office of statistics and the Argentine government fought out over the inflation numbers in the country. So official institutions, under direct control of the government, publishing data stories about how well or how bad the country is doing, are a risk. Framing data, cherry picking, changing definitions: a lot of techniques exist to spin a data story. And that is without even mentioning just falsifying data. But are media doing their jobs? so let’s do the data journalism ourselves and make headlines that way. It’s true: especially in smaller news rooms, numeracy and statistical knowledge are generally quite low. And with the existing time pressure natural to news rooms, stories hidden in data are usually overlooked and official statistics don’t make it into the news because of that. So who should publish the data stories?